The spirit beings of Bugarregarre (the Dreamtime) created all life as we know it. They enabled spirits to take form and gave us the law. This way everything could function in harmony. This law encoded in the Song Cycle has been passed down unbroken since creation. It is our record of history. It is the Law-keepers, Law-people, and custodian's job to keep passing Bugarigaara ceremonies and stories from one generation to the next. 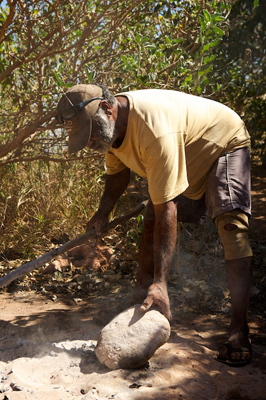 In 1987, Paddy Roe initiated the Lurujarri Heritage Trail as a trigger to encourage the members of the Goolarabooloo community to be walking the Country again, as had always been done; to conserve; renew and stay connected with their heritage and traditional skills and to keep the same alive for generations to come. 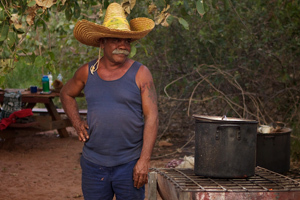 He also sought to wake up non-Aboriginal people to a relationship with the land; to foster trust; friendship and empathy between the indigenous community and the wider Australian and International communities. With the dream to share his ancient culture with outsiders - whitefellas - Paddy first invited people to join his family on the trail in 1987. Three years later he was awarded an Order of Australia Medal for his facilitation of cross-cultural understanding. 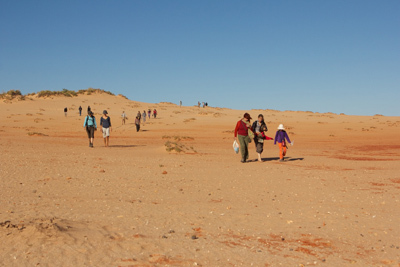 The Lurujarri Trail follows the land of the traditional Song Cycle. 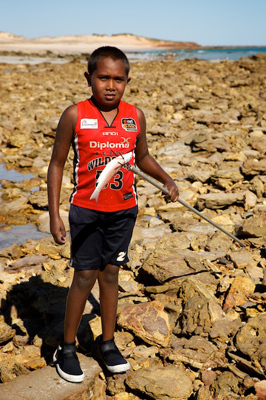 The same camping places are used as have been used for millennia, the same reefs fished. The middens in the dunes are thick with shards of past feed, spear heads, charcoal flint and grinding stones, and testify to how long the Law and Culture has been going on. The dunes are laced with the bones of the old people who have lived here, fished, sung to the Country, and painted up in its ochres to dance. They have been buried where they passed on, and left to rest in the older camps, that are now left in peace out of respect. Walking in this sometimes difficult environment can be taxing for those unprepared. Please make sure your walking shoes/ sandals are worn-in. Some prior physical preparation is highly recommended. A medium level of fitness in required. Timber can be sought out and cut for carving workshops. 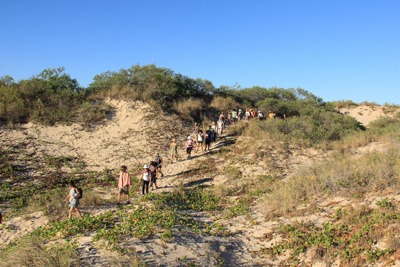 Opportunities to participate in the making of Karli (boomerang), coolamon (water bowls) or cumbuk (clapping sticks) may also exist along the trail. Some say the land is there for the benefit of people alone. But how can that be? Like humans, the wallabies and trees, rocks, and water are all made of the same living vibration spirit. When we know this intelligence, when we fathom what is at the 'bottom' of everything we can, as human beings, realise our purpose and the meaning of our lives. It is our dreaming that people of all colours and beliefs will come together to walk and look after this land as the Aboriginal people have done since the first day, experiencing the feeling of the sacredness of life, for from this feeling flows the gift of continuing life for all children to come. The time we walk is likely to fall within the season of Barrgana - the dry time, SE wind time. Nights are characteristically cool with sea mist coming inland, while days, on average, reach around 30 degrees Celsius. Lirigen and Iragalu (acacias) flower, also Jigal (bauhinia), Gardgu (inland bloodwood) and Gungara (conkerberry) fruit. Flocks of cockatoos and brolgas will be feeding on the bush onions. The osprey, honey-eaters and raucous red-winged parrots are likely to be breeding. Black kites may be seen over the dunes when the salmon are running (they share the same tail shape) and mobs of pelicans, mullet, catfish and dugong should be fat; as are the kangaroos. Lizards are likely to be underground in hibernation. 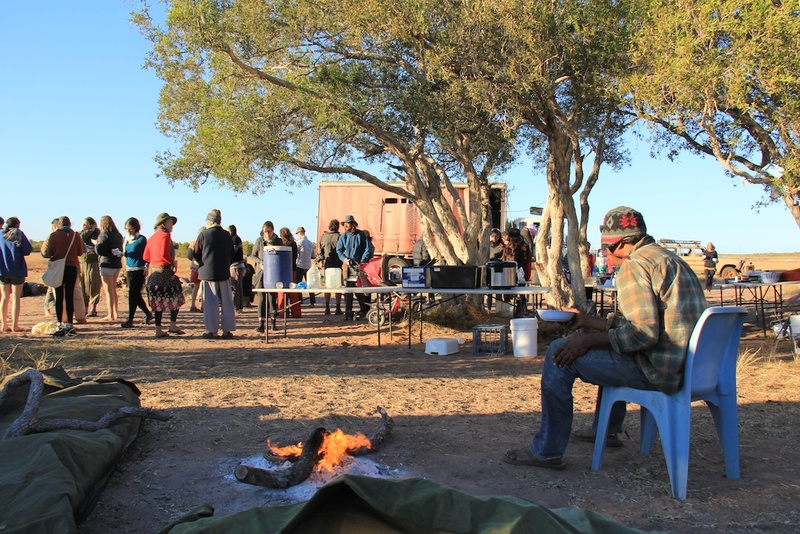 Please note that the July trail is reserved mainly for students from RMIT and La Trobe university, a realtionship the Goolarabooloo people have had for a number of decades.